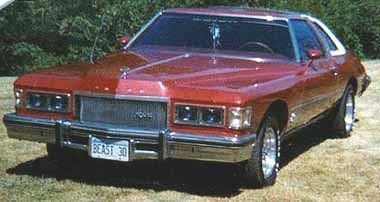 Introduction: The Buick Riviera was not a muscle car, per se, but it had a tremendous impact on the American automotive scene. The Riviera represented one of the most successful American attempts at capturing European styling and performance in a large automobile. Positioned at the top of Buick’s coupe line up, the Riviera always represented cutting edge styling and performance and deserves a place in American automotive history. Comments: Known as model 4747 and only offered on the sport coupe body style, the Buick Riviera was a huge success, selling 40,000 copies. It sported a dramatic design that broke away from the Detroit mold and into a new era of styling. The front fenders had leading edges that were actually vertical grilles, the rear contours angled to razor edges, and the doors featured frameless windows, a new concept. The standard engine was a 401 cid V8 with 325bhp. For just $50 more, the buyer got a 425 cid V8 with 340bhp. Positioned as a luxury coupe, the Riviera came with every conceivable luxury option and would soon become the flagship of the Buick line. Engines: 401 V8 325bhp @ 4400rpm. 425 V8 340bhp. Performance: 425/340: 0-60 in 8.0 sec, 1/4 mile in 16 sec. Comments: 1964 saw very few changes to the Riviera as it continued to sell well. There was some minor exterior changes but the real excitement lay under the hood. There, the top 425 cid engine could be optioned with a second four barrel carb which provided an extra 20 bhp. Handling continued to be a sore spot, however, as its two ton weight took its toll in the curves. Engines: 401 V8 325bhp @ 4400rpm. 425 V8 340bhp. 425 V8 (2×4) 360bhp. Comments: Buick added a Gran Sport (GS) option for the 1965 Riviera, further blurring the line between performance and luxury. The Gran Sport option included the 425 cid, 360 bhp engine along with a Posi-Traction rear end and 3.58:1 gearing. 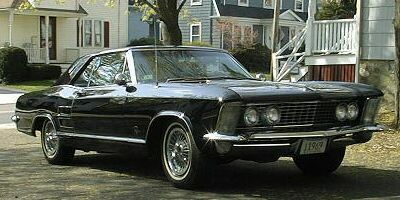 All Riviera’s received minor new exterior styling, including headlights that were stacked in front of the fenders and were covered by clam shell doors when not in use. The taillights were also restyled and now stretched almost the entire width of the car. Top speed was estimated at 125 mph. Engines: 401 V8 325bhp @ 4400rpm. 425 V8 340bhp @ 4400rpm, 465 lb-ft @ 2800rpm. 425 V8 (2×4) 360bhp. Comments: The Riviera underwent a major restyle in 1966, the start of the second generation. The headlights were moved back in the grille, and retracted above the grille when not in use. The vent windows were eliminated and the roof and rear deck gained fastback like styling. The hood became longer, reported the longest ever on a car, and the taillights were redesigned. The GS lost its two carb option (though 198 copies were dealer installed), and the 401 engine was dropped, so the 425 cid 340 bhp became the only factory engine choice. The restyle was a hit with customers and 45,348 copies were sold, a 50% increase over the year before. Engines: 425 V8 340bhp @ 4400rpm, 465 lb-ft @ 2800rpm. Performance: 425/340: 0-60 in 8.6 sec, 1/4 mile in 16.4 sec @ 84 mph. Comments: The big news for 1967 was the retirement of the 425 cid engine and the introduction of a new 430 cid V8. Although the displacement had increased by only 5 cid, horsepower was once again at 360 bhp, the highest rated standard engine of any muscle car. Furthermore, the new engine was much smoother and breathed better. The GS version was still a bargain at just $138 and included the 430 engine, custom suspension, Posi-Traction differential, and red-line or white stripe tires. The grille was slightly changed on all Riviera’s and sales were good at 42,799 copies. Engines: 430 V8 360bhp @ 4600rpm, 475 lb-ft @ 3200 rpm. Performance: 430/360: 0-60 in 7.8 sec, 1/4 mile @ 86 mph. Comments: The 1968 Riviera now shared sheetmetal with the Cadillac Eldorado and the Oldsmobile Toronado but remained rear wheel drive while its two brothers switched to front wheel drive. The grille was restyled again with large parking lights housed in a new front bumper. The headlights still retracted above the grille and retractable windshield wipers made their debut. The Gran Sport option was still available and performance was good, despite a 4,222 lb curb weight. Top speed was an impressive 130 mph. In all, 49,284 copies were sold in 1968. Performance: 430/360: 0-60 in 8.1 sec. 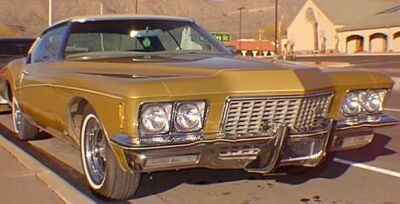 Comments: The 1969 Riviera saw minor changes which included new body side trim, bright wheelhouse moldings, and bright lower body moldings with argent accents. The Riviera still came highly equipped and the GS option, at just $131.57, was an absolute bargain. 1969 was the peak of the Riviera’s popularity as 52,872 were sold. This would be the last year for the 430 engine. Engines: 430 V8 360bhp @ 5000rpm, 475 lb-ft @ 3200 rpm. Performance: 430/360: 0-60 in 9.2 sec. Comments: The 1970 Riviera saw a disastrous redesign which added rear fender skirts and the elimination of the retractable headlights. A new standard engine was introduced, a 455 cid V8, which sported 370 bhp and a whooping 510 lb-ft of torque. Despite the increase in engine performance, weight also ballooned up, resulting in slower 1/4 mile times. Sales dropped to only 37,366 copies. Engines: 455 V8 370 bhp @ 4600 rpm, 510 lb-ft @ 2800 rpm. Performance: 455/370: 0-60 in 7.9 sec. 1/4 mile in 17 sec. Comments: The 1971 Riviera featured one of the greatest styling exercises in automotive history. Dubbed “the boat-tail,” the look was supposed to draw upon stylish cars of the 1930s, but putting the design on a 218 inch length, 122 inch wheelbase, 4,247 lb car resulted in a look that buyers either loved or hated. Sales dropped to 33,810, though this might have also been caused by a downgrade in the engine department. General Motors had decreed that all its engines had to run on unleaded gasoline to meet stricter emission standards and thus the 455 engine was detuned, down to 315 bhp. The 455 engine in GS models were rated at 330 bhp and included the usual performance equipment to go along with that power. Performance did suffer, with the top speed falling to 120 mph. Engines: 455 V8 315 bhp. (GS) 455 V8 330 bhp @ 4600 rpm, 455 lb-ft @ 2800 rpm. Performance: 455/330: 0-60 in 8.1 sec. 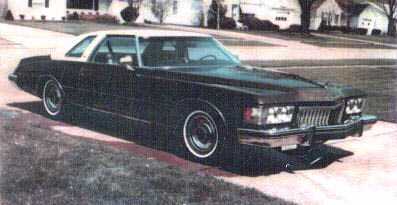 Comments: The 1972 Riviera continued to sport the “boat-tail” design, but the vents on the trunk lid were eliminated. GM decreed that its engines had to be rated in net SAE output, a more realistic measure of engine power, and the Riviera’s 455 power rating dropped to 250 bhp for the base model and 260 bhp for the GS. Top speed fell to 112 mph. Engines: 455 V8 250 bhp. (GS) 455 V8 260 bhp @ 4400 rpm, 380 lb-ft @ 2800 rpm. Comments: The 1973 Riviera continued with the “boat-tail” design, but with a more conventional rear end. Sales were up slightly to 34,080 copies. 1973 would be the last of the truly collectible Riviera’s. Engines: 455 V8 250 bhp. (GS) 455 V8 260 bhp. Comments: The 1974 Riviera was a far cry from the stylish Riviera’s of the past. With dumpy styling and a curb weight of 4,572 lbs, sales dropped to 20,129. The 455 continued to lose power and was now rated at just 210 bhp. Engines: 455 V8 210 bhp. Comments: Sales continued to fall to 17,036 as the Riviera began to resemble the rest of the Buick line up. The 455 engine continued to drop in power, now down to a pathetic 205 bhp. The 455 would continue until 1978 when it was replaced by 350 and then 403 engines. The name “Riviera” would be applied to several Buick models in the next twenty years, though none would ever hold the premium, style setting position as the great Rivieras of the 1960s and early 1970s.